First things first, let's announce the winner of last weeks Wild in the Hollow giveaway! "But people don't need fancy and flashy, they probably just want regular. They don't need a fixer, they need a journeyer. They just need to sit on a bench with someone else so they know they're not alone. I know this because it's what I need to." I can't tell you how many times I wrote, "Me too" in the margins and underlined entire paragraphs. Simply Tuesday is a reminder that it's ok to be small, after all wasn't that Jesus' way? In a world where loud, busy, and overachieving is celebrated it's nice to remember we don't have to be this way. Jesus knew the importance of getting away by himself and being quiet. In those moments of quiet the world goes silent and God gets louder. This reminder to be small is one of self -evaluation. Not taking the ordinary of days for granted in pursuit of something more...bigger. I have the tendency to look around at the work of others and think, what they are doing is more worthwhile and important than what my work is. I needed to read Emily's words to remember that what I'm doing, what "they" are doing isn't better just different. "We were not made to fill our souls with worth with we construct with our hands." Simply Tuesday is a call to find the gift in each day and be content with the work God has given us in our corner of the world. God is using each of us and will fulfill His will in our lives in His time, not ours. So in the meantime let's relax and find joy in the simple pleasures each day brings. One thing I really loved about this book is that at the end of each chapter she has study questions and a prayer. If you wanted to do a book club, it's ready made for it! 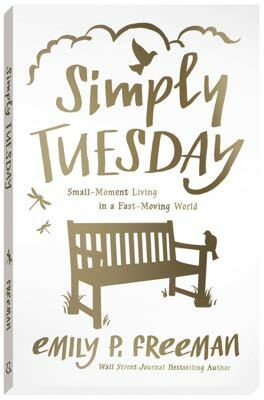 I hope you find time to sit and savor the words in Simply Tuesday, you won't be sorry! I was a member of Emily's launch team and it was my pleasure to read and give my honest review of her book :). Wild in the Hollow: Book Review & Giveaway!